Photo Caption: Members of the Student Government Association (SGA) at Berkeley College in Newark, NJ, host a charity gala for Autism Speaks on November 16, 2017, at Iberia in Newark. More than 60 students, faculty, alumni and friends attended the gala, organized by SGA to benefit the advocacy organization’s efforts in providing resources to individuals with autism and their families. 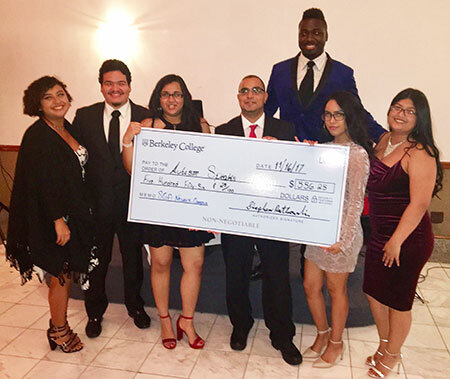 Members of SGA also held two additional fundraisers leading up to the gala during the fall semester, including a car wash with students at Berkeley College in Woodbridge and a “game day” at the Newark campus. In total the fundraising initiatives raised more than $600 for Autism Speaks. Berkeley College students and alumni pictured above from left to right are Rhiannon Otayza of Kearny, NJ; Neftali Fernandez of West New York; Aarti Patel of East Orange; Fernando Antonio Ruiz of Bloomfield; Samba Taha of East Orange; Nathalia Vazquez of Elizabeth; and Bettsy Otayza of Kearny. Click here to view more photos from the charity gala.